I've always been a fan of her fiction, but this book has taught me more in one reading than any cookbook or how-to book I've ever read. Next up is In Defense of Food, I have high hopes for that one as a companion read. I have never shopped from one in my life until now. Link to the blog is on my blog list. On Saturday mornings, they have a hot breakfast. Also, local live music. Not exactly hip, but authentic to the area for sure. 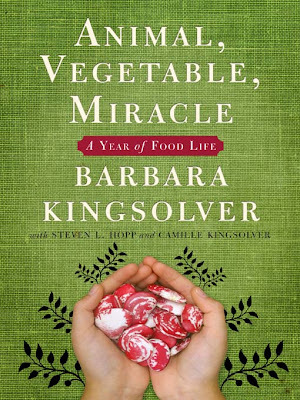 The book above has great seasonal recipes to help me figure out how to cook this fresh produce. Seriously. Pesto, guacamole, tapenade, dressings. Where has this little machine been all of my life? This stuff in jars at the store is not fresh and much more expensive. I know I won't be happy the first time I slice my fingers washing the blade, but it's worth the risk. Potato Cucumber salad, no mayo and loaded with fresh herbs and balsamic. Come on! Haven't sampled it all yet, it's mostly marinating. But very shortly...yum! I know the eventual challenge will be having to work again. Uh, oh yeah, that professoring thing. But at some point I also want to learn how to make batches, freeze things. I'm on my way! If you can gulp down your pride (and your paycheck), get a Vitamix blender. It will change your life, for real. Best kitchen appliance I've ever bought.